Hanifen Towing | There when you need us. Hanifen is your choice for towing in the Des Moines area and its surrounding cities. Hanifen Co., Inc. is a well-established towing and recovery company that was founded in 1923 by James E. Hanifen in downtown Des Moines. In 1959, James’ son, James E. Hanifen, Jr. relocated the company to a 10-acre lot just off of I-80 in Des Moines. It quickly grew with great reputation and great service and today, Hanifen Towing is not only the oldest and the largest established towing company in Des Moines, Iowa but continues to stay ahead of the times with an impressive state of the art fleet. Hanifen’s property consists of 10 acres, 8 buildings, a multi-level dock, and a camera security system for safe storage of your equipment. We have a 48-state authority and offer towing and recovery services 24 hours a day, 7 days a week, 365 days a year. 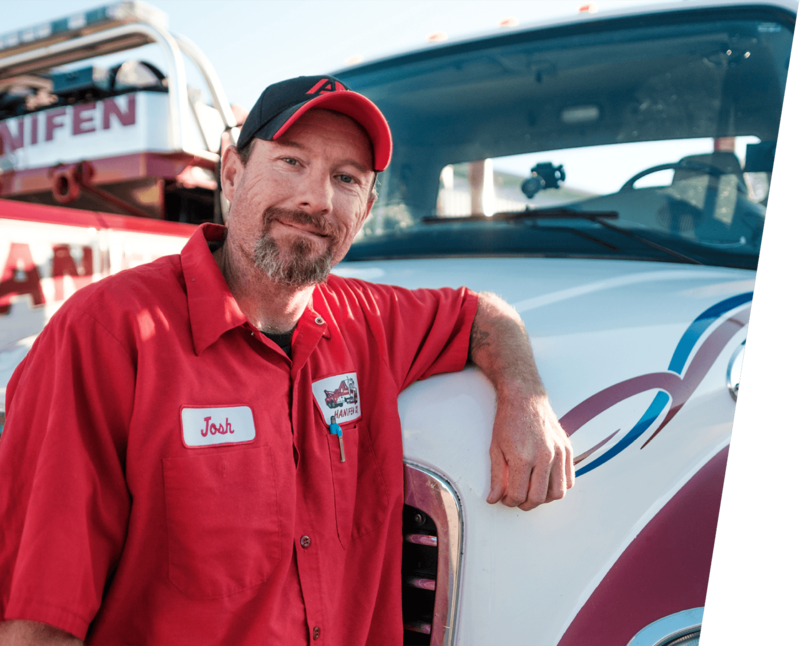 From a minor fender bender to a major tractor and trailer recovery, we have the best selection of tow trucks to get the job done. Utilizing the proper equipment, Hanifen employees get the job done right and in a timely manner. We pride ourselves to hold the highest standards in our business and are capable of handling any of your towing and recovery needs. An amazing family owned local towing company, they are very professional with well maintained uniforms and equipment. They have small wreckers as well as large semi sized hauling equipment. All of the staff has been amazing that I have met! They have guys on call for when you need them! Which is great because when are you stranded at a normal 9-5 M-F hour, hardly ever! They are 24/7. I will be using their services and I keep their card in my wallet if ever I have trouble I know that they are reliable, quick, and also very reasonably priced, and will handle my vehicle with care. Shop local first!!! Another little note, Hanifen Towing is HUGE into community involvement! I just wanted to give extra kudos for that! What a crew over there. They are very professional and get the job done at hand when ever you call. Thank you for all that you do. Called 5 different tow companies today. They answered, were polite, even mentioned another company if I was in a hurry. Charged less than the quote. And I simply cannot say enough positive things about their customer service!!! Their office and drivers were so professional and polite…SIMPLY WOW!!! Highly recommend and would definitely use them again!!! AGREEMENT AGREEMENT I understand I cannot request towing via this form. For general questions or any inquiries about us or our the services we offer, please fill out the form below. We love to hear from you! We are unable to schedule towing via email. If you are in need of a tow please call our number.